Robust and sturdy, the WS429X is a heavy duty cable marker. Originally designed for marking large diameter power cables, it is ideal for telecommunications and fibre optic cables,where long runs without attention are required. A ‘Low Foil Warning’ can be used to enable a new foil to be brought into use before printing is missed. A ‘No-Print Detector’ will trigger an alarm if for any reason the marking does not appear on the output side. Apart from the XNR type, shown right, the WS429X can be supplied with a Hand Lever Reset (HLR). Solid welded construction provides rigidity, stability and total reliability. It is maintenance free, and the only routine service is the cleaning and lubrication of the numbering head, and the cleaning of the venturi valves in the foil tensioner and the used foil take off. 1. The Die Wheel is fitted with a full circumferential heater. Wheel temperature is controlled by a Surface Mounted Thermostat (SMT).
. The Marking Head assembly, which includes the print and friction wheels and the foil let-offs, is raised or lowered by an air cylinder, controlled by a hand operated valve. Marking Pressure is adjusted by means of a screw knob. 3. In the WS429XNR, the Pre-Determined Counter will automatically reset the numbering head to zero during printing operations, or it may be reset manually by using the Reset Button on the control panel. 4. Where the Foil Let-Offs (single or dual) are fitted with Low Foil Detectors, an amber warning light flashes and an audible alarm sounds when the foil on the reel runs down to a pre-set level.
. A Venturi Foil Tensioner keeps the in-fed foil under control, and takes up the overrun. It reduces the probability of foil breaks, and optimises foil economy. 6. 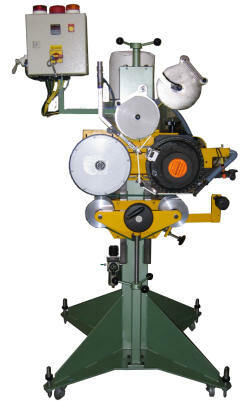 A Foil Guide Roller accurately aligns the foil with the marking dies. 7. The Venturi Used Foil take-Off collects the used foil, and directs it into a Used Foil Collection Bag. The Used Foil Collector Unit is fitted with a 12″ x 12″ bucket type filter/exhauster. 8. The support guide rolls are coupled by a PU drive. Running on sealed bearings, no maintenance is required. Rolls may be vee grooved or formed as required.